Lithographic print with original hand colour. Lithographed by Thomas Dutton after the painting of Oswald Brierly and published by Rudolph Ackermann in the Strand, London in 1853. There have been five ships in the British Navy named after the Greek King, Agamemnon, who led his forces in the Trojan Wars. This ship, launched in 1852, was the second to bear his name and bears the distinction of being the first British warship to be fully kitted out with steam engines. At the time steam power was still relatively unproven so the ship was expected to need traditional sails as back up; hence the three masts and full rigging. Agamemnon saw action in the Crimean Wars and was involved in the bombardment of Sevastopol in 1854. Its other claim to fame was that it had a pivotal role in creating the first trans-Atlantic telephone cable in 1857. 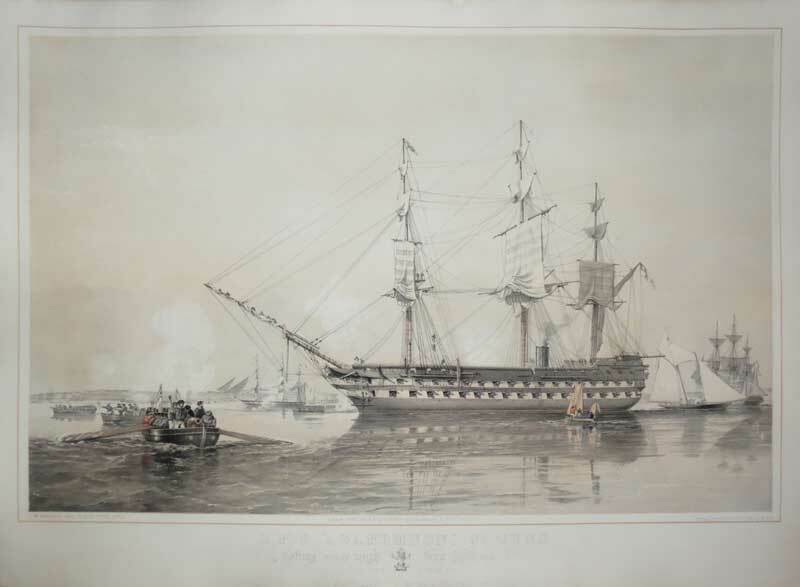 This print is the combination of two great maritime artists of the mid nineteenth century. Both Dutton and Brierly are considered to be the best in their field and between them have produced some of the finest marine images of the century.